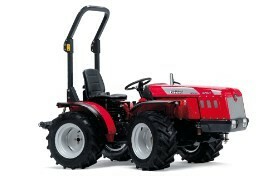 New and used Alpine tractors, Hillside tractors, quad Tractors, low impact tractors, compact tractors, all terrain tractors. Around 20 years ago we wanted to come up with a name that best described a tractor that can work on the type of terrain where the ‘traditional’ design of tractor become unsafe. The name we chose was ‘Alpine Tractors’ and it has now been adopted by the industry and media as a generic term for any this type of tractor. Other companies sometime refer to them as: Hillside tractors, quad Tractors, low impact tractors, compact tractors, all terrain tractors. But there is really only one name that matters. 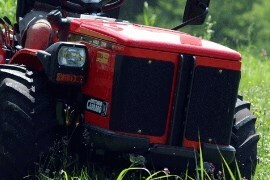 Riko UK are the UK's longest established, and most knowledgeable supplier of Alpine Tractors. 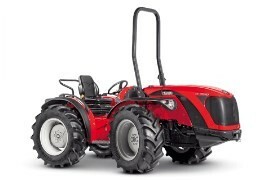 When you think about tractors, you probably create a picture in your mind of the traditional layout. Starting at the front with small front wheels, then an engine and clutch, then gearbox all coupled to a rear axle with a three point linkage, PTO and large rear wheels. Well why wouldn't you, after all that's how they are all made, all pretty well the same specification, just a different colour and made in a different factory (but you can't even be sure of that nowadays). 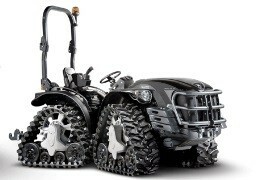 Alpine tractors range from 23 to 99 HP, are around 3 metres long and some models can even be under 1 metre wide. A good range of gears and working speeds. Alpine Tractors have a choice of hydrostatic or manual transmissions with a choice of 8fw X 4rv gears or even 32 gears with a forward to reverse shuttle. Working speeds are up to 40 kph. Alpine Tractors have a central oscillation joint so the front and rear halves of the tractor can follow the undulations of the terrain independently, and a low centre of gravity which, as the name suggests, makes them ideal for working on slopes and hills. 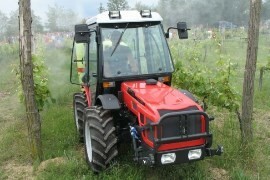 In static sideways stability tests, Alpine tractors have been shown to remain stable even at 55 degrees. However, it is not possible to state a specific safe working angle. The reason for this being the huge number of variables and just a few of these being, overall width, tyre selection, implement being used, ground conditions, weather conditions, and of course the level of compitence and training held by the opperator. As with any machine, or tool, users should always seek professional training. Manoeuvrable with good traction, good lift capacity but not too heavy. Alpine tractors have four equal size wheels with front and rear differential locks, linkage lift capacities up to 2300Kg, but weigh from only 880Kg up to 2500Kg without ballast weights. There is also a choice of front steering or articulated steering with a turning circle as small as 175cm. Alpine tractors have a choice of PTO speeds and even ground speed and a choice of rear 3 point linkages with or without quick hitch couplings. There are also optional front linkages on most models, and front or rear loaders with all sorts of attachments. 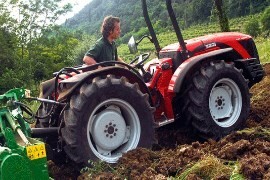 In fact, Alpine tractors will take almost any implement a tractor usually takes and make it more versatile. It needs to be versatile. Some Alpine Tractors are bi-directional so you can turn the seat and controls round in a matter of seconds and drive it backwards with the implements in front of you such as mowers, or a fork lift or a drive in rear mounted loader. And of course it needs to be at a sensible price. 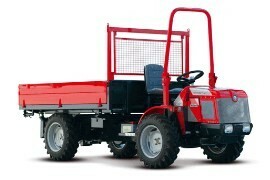 New Alpine Tractors start from around £12-13,000 + Vat with roll bar. A tall order, you might think. Well, Riko UK's Alpine tractors are everything above and more, truly versatile and affordable machines that do everything a conventional tractor does, only better!